From the mountains of Snowdonia to the inner-city clubs of Cardiff; this immersive film showcases the vibrant Welsh music scene and the landscape that helps define it. 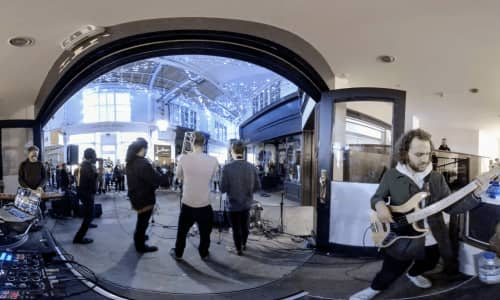 Voices of Wales was shot in 360º immersive video, capturing the magic of the moment inside six hemispherical lenses which transports you there to experience it for yourself. All six tracks were specially recorded and mixed in three-dimensional 360º audio, treating each immersive scene as a full 360-degree sphere of sound, with you at the centre. Throughout the summer and autumn of 2018, cameras followed the hottest talent emerging from Wales; from the Green Man Festival to the Welsh music stronghold of Clwb Ifor Bach. Discover the badass Welsh girl band, Adwaith, modern folk singer-songwriter and multi-instrumentalist The Gentle Good; Astroid Boys’ high energy fusion; Afro Cluster’s club-jazz-rap synthesis, the Brythoniaid male voice choir, and the unique electronic sounds of Marged. Follow these emerging Welsh music acts through dramatic landscapes and hear what it means to be an artist in Wales today. Come and experience these immersive gigs for free at the Centre from 2 – 4 May 2019 or watch via our YouTube and Facebook channels. For the best viewing experience we recommend wearing a VR headset. VR and 360 content may not work for you. Due to the immersive nature of VR headsets, some viewers can become disorientated, lose balance when standing and experience nausea and sickness. If you experiences any of these, the removal of the headset is recommended. If you are prone to the effects of strobe lighting and rapid music then you should also avoid watching this VR film. This project was funded by Welsh Government.